Position: Post-Doctoral Research Associate, Now working at Dr. Sue VandeWoude’s Lab at Colorado state University but still working with us on mtn lion and sea otter population genomics and conservation genetics. Education: B.Sc, Biology, Washington & Lee University, 2008; Ph.D. in Ecology and Evolutionary Biology, Tulane University, 2015; Completed 2-year Postdoctoral Research Position, our lab May 2017. 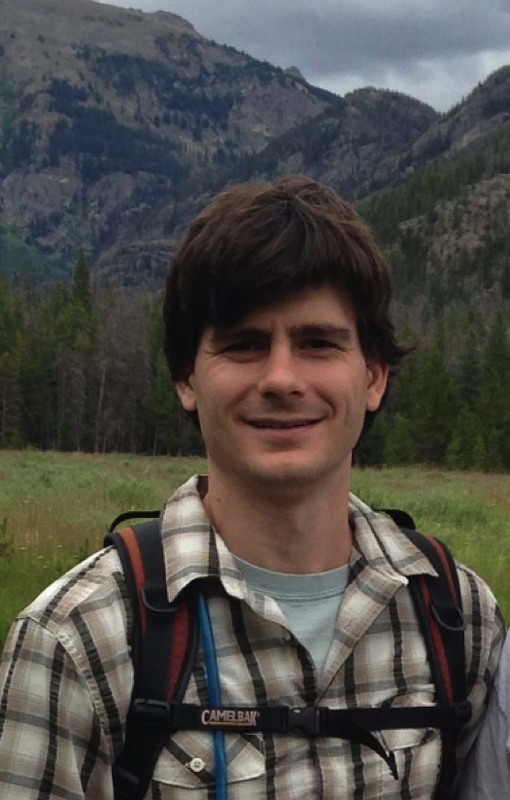 My work uses molecular and ecological techniques to better understand population structure of wildlife as well as the origin and epidemiology of infectious disease in wildlife. The goal of this work is to further our understanding of the ecology and evolution of wildlife as well as their pathogens in order to guide remediation and prevention of wildlife disease. 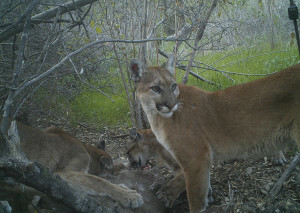 Using a landscape genomics approach, I am assessing the fine scale genetic structure of California mountain lion populations living among urban development. This work will serve to inform conservation of mountain lions as well as determine the utility of next generation sequencing as a tool in wildlife conservation. In addition, as part of a collaborative NSF funded project, we will use the information of population connectivity to inform network models. These models will be coupled with information on the transmission of apathogenic mountain lion viruses to develop models of disease transmission in mountain lions. Southern Sea Otters (Enhydra lutris nereis) play a key role in the kelp forests along the Central California coast. However the fur trade in the 18th century nearly wiped out the species. Despite their placement on the Endangered Species List in 1977 the populations have been very slow to recover. Every year many otters fall victim to disease, parasites, pollution and occasionally are injured by humans. Together with the Monterey Bay Aquarium and the Marine Wildlife Veterinary Care & Research Center we are working to develop a large and informative suite of genetic markers to help track the flow of disease through the otter populations of California. My research focuses on the introduced nematode parasite, Camallanus cotti, which is the most common parasite infecting endemic Hawaiian stream fishes. 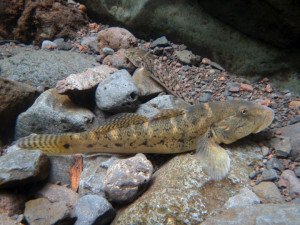 My work serves to (1) determine abiotic and biotic drivers of parasitism, (2) use molecular techniques to reconstruct invasion pathways, determine contemporary gene flow, and compare host parasite population genetic structure, (3) evaluate how predicted climatic changes, such as reduced precipitation, could alter disease of endemic Hawaiian stream fishes. Amphidromous fishes have a unique life history in which adults of obligate amphidromous species live and spawn within freshwater, eggs hatch in streams, and larvae are washed out to sea where they develop for up to six months before recruiting back to a stream. The life history strategy has a large effect on the evolution of the species as it promotes colonization of remote locations, such as Hawai`i. It is not known, however, the extent to which marine dispersal limits island/watershed level divergence. In addition, the amphidromous life history requires ocean stream connectivity and thus increases the vulnerability of species to habitat degradation at stream mouths and drying of streams due to water extraction or reductions in precipitation due to global warming. I grew up in Philadelphia, a city that provides great outdoor opportunities as well as easy escapes to the beach or mountains and fostered my passion for the natural world. I obtained my Bachelor of Science from Washington and Lee University in Lexington, Virginia, where I was a member of the wrestling team and Outing Club. I obtained my PhD in Ecology and Evolutionary Biology from Tulane University in New Orleans. 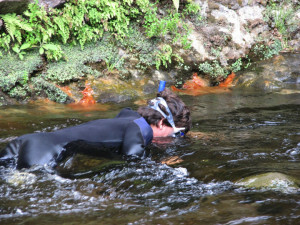 My dissertation field work was conducted in Hawai`i where I spent time on the five Hawaiian Islands with perennial streams. 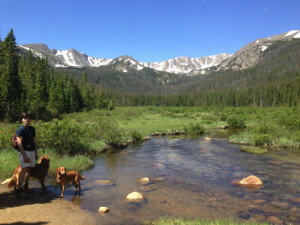 I recently moved from Fort Collins, Colorado to Laramie with my wife, who is a veterinarian working at a clinic in town, as well as my cat and two dogs. I am a passionate hiker, surfer and skier and if I am not in the lab I can often be found enjoying the wonderful wilderness surrounding Laramie.